AS a kid I would see these gel candles sitting around and of course wanted to play with them but knowing better I never did. Well now that I am a adult and found these candles cheap at a local store I decided to grab two. Really I bought them for a theme dinner but I had another thing in mind the whole time. When the dinner was done I gave each of my kids one. I asked them about the smell and even the color of the shells. We covered almost all of the 5 sense but taste! For sure, not edible. 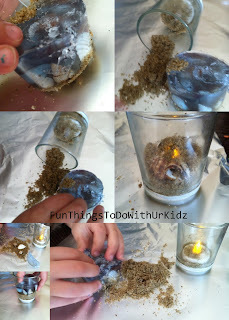 lol When they were done everything but the gel went back into the cup and was still used as a light for awhile after.